PEER Bearing designs and manufactures award-winning precision bearing solutions to industry leaders around the globe. Tapered roller bearings (TRB) are an important product category at PEER, featuring low maintenance requirements and long service life. 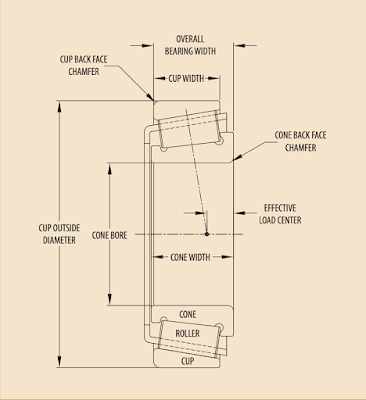 PEER’s tapered roller bearings consist of tapered cylindrical rolling elements housed in an outer raceway known as a cup and an inner raceway referred to as a cone (see assembly diagram below). The operating principle behind the design of the TRBs relies on the relative motion between cones in contact, which creates a true rolling motion if their axes converge to a single point. Hence there will be no sliding friction between the surfaces in contact, such as between the inner surface of the cup, the inner/outer edges of the rolling elements and outer surfaces of the cone. This design creates a large contact area between the rolling and housing elements, making them capable of bearing large loads. Since the rolling elements are tapered, they can carry both axial and radial loads. The greater the angle of the taper, the greater the contact angle, increasing the thrust load that the TRB can carry. PEER is involved in all aspects of bearing fabrication from design to production to ensure that all parts of our tapered roller bearings are able to withstand the loads they encounter. No matter the type, the cup and cone of tapered roller bearings are separable pieces. This allows for optimal preload and clearance between cup and cone. PEER's tapered roller bearings have advanced features such as raceway surface finishes, controlled roller to rib contact, optimized rollers, and undercut designs that improve bearing performance and service life. PEER Bearing has been a leading global provider of bearings since 1941, serving industries such as agriculture, electrical, fluid, material handling, industrial transmission, and off-highway vehicles. At PEER, we design and manufacture tapered roller bearings to stringent customer specifications—no matter how difficult your requirements might be. We are committed to providing excellent customer satisfaction through timely delivery and top-notch customer service. Our manufacturing facilities are TS 16949 certified, and our distribution facilities are ISO 9001 certified. We conduct testing in-house and also at independent test facilities. You can count on us for superior engineering and technical support. Contact us today about any questions or quotes for standard and custom bearing needs.